We love our whipped cream in coffee, on berries for dessert, really on any of our primal desserts. But it’s nice to have an alternative to dairy and for our Paleo friends. Henry thought it would be good to have some cold coconut milk and stuck a can into the fridge for a couple of hours. When he opened it he noticed that it had gotten very thick on top, so he scooped it out and noticed that it had separated from the coconut water. So he added a little cinnamon and a little organic vanilla extract to the thick coconut and whipped it up. To our happy surprise it got thick and creamy immediately, and Oh Wow!!! sooooo good. So since then we’ve been enjoying our morning cup of coffee with a spoon full. So here are a couple of pictures for you – try it, it is so incredibly easy and completely gluten and dairy-free. Step 2: Make sure that you scoop out all the thickened coconut cream, and that the water is left over. Don’t discard the water, use it to drink or in a shake. Step 3: After scooping it out, add a little cinnamon and vanilla, and whip it in a mixing bowl until it begins to thicken. Wow! That looks great. Gotta try this! And looks like you whipped it by hand–so that is easy. Thanks for the great alternative to cream! Hey KSH, you must not have read the article above or you would see it’s from the fridge you idiot. You don’t know there’s no need for insults. Hi.. I tired this.. left the can overnight and it still came out nothing like whipped cream. It was really runny still..any tips? I tried this but it did not work. the coconut milk was still runny and never separated from the water. Idontknow is just a troll, Ignore it. There are two qualities of Coconut milk available in the grocery store. Shake the can– if u hear the liquid in the can, it is the lesser quality. The good stuff is silent and full fat. The THAI KiTCHEN brand is expensive and makes noise. The no-noise type is best, but be careful not to include any trapped liquid in ur whipped cream. “Fridging” it makes the whipping process better. Keep in mind that it must have the fat in it. Most of the Coconut milk I have bought goes into the refrigerator and has never separated. It would be like buying regular milk at the store and expecting the cream to rise to the top..aint gonna happen! I am in China but this is the first time I have heard of whipped cream made out of coconut milk (just trying to buy regular dairy cream in China is a nightmare in logistics) and I have bought numerous containers of coconut milk here. Next time I will pay closer attention to product description and see if one has a higher fat content and also look for the Thai canned coconut milk. Guess what’s going into my next coconut creme pie! Thanks for sharing this recipe. I often use heavy cream but I find that my body doesn’t always agree with it. I guess that’s why we primal folks tend to stay away from dairy. This seems like it would be an awesome substitute. Same here Heather. I can drink the raw milk and cream with no problems at all. Glad to know I am not crazy! But where do you get raw grass fed dairy? I believe it is against the law to sell it in Miccigan. Gabriella – only animal products have cholesterol. I did not expect to see cholesterol listed on a can of coconut milk, but I just checked Thai Kitchen, and both “premium” and organic types list cholesterol as 5 mg per 60 mL! I happened to have a can of Native Forest organic, and that lists cholesterol as 0 mg, the same with my coconut oil. So what is Thai kitchen doing to their coconut milk?? I do know for certain that coconut fat is high in saturated fats, which may raise bad cholesterol (LDL) in your blood. At the same time it may raise good cholesterol (HDL). If high cholesterol is a concern do your research, ask a professional, and in the meantime, use sparingly! There actually is cholestrol in Coconuts and Avocado. It is the healthy fats your body needs to have though. The can says cholesterol: 0 mg.
Adam, I use Coconut milk or almond milk for nearly everything that I cook..I even use it in my cereal. We rarely use dairy except cheese which is a familial weakness. Ha! But I have NOT YET tried this. I can’t wait! Thank you for such a wonderful idea!!! I had given up all dairy except for the little half and half in my morning coffee because i had not found an alternative I liked. Well thanks to you now I have!!! Thanks for all the wonderful blog posts! I am fairly new to this eating lifestyle and have really been inspired by your blog. Hazelnut is my current favorite in coffee, but who can complain about having coconut whipped cream in their coffee? if you have a local health food store or trader joe’s maybe? there is a GREAT coconut milk creamer in different flavors that I love. Made with coconut milk…no dairy or soy. The brand is So-Delicious …or see if your local walmart can get it by talking to the right manager. I’m currently working w/mine. since they carry the brand in coconut milk and almond milk in the fridge section. Almond milk doesn’t work in coffee but a little coconut milk does. I also like those syrups….from sam’s they have pure can sugar in them and no dyes listed. My favorite is the carmel. I whip mine with one of those hand blend little battery operated foamers? can’t remember what you call em. Love it I use it every morning, very yummy! I like French Vanilla they also offer Hazelnut! I don’t use that brand because there are so many other ingredients. When you get the right coconut milk you can get only coconut. I have been using the So Delicious Coconut Creamer for my coffee in the past year since I went gluten and dairy free – but just discovered that the Xanthan/Guar gums can also be problematic for gluten intolerance folks. So now I might make my own with the pure coconut milk! PF – Carrageenan is kelp. Definitely not an unhealthy ingredient. It’s in tons of stuff and is used as a thickener. 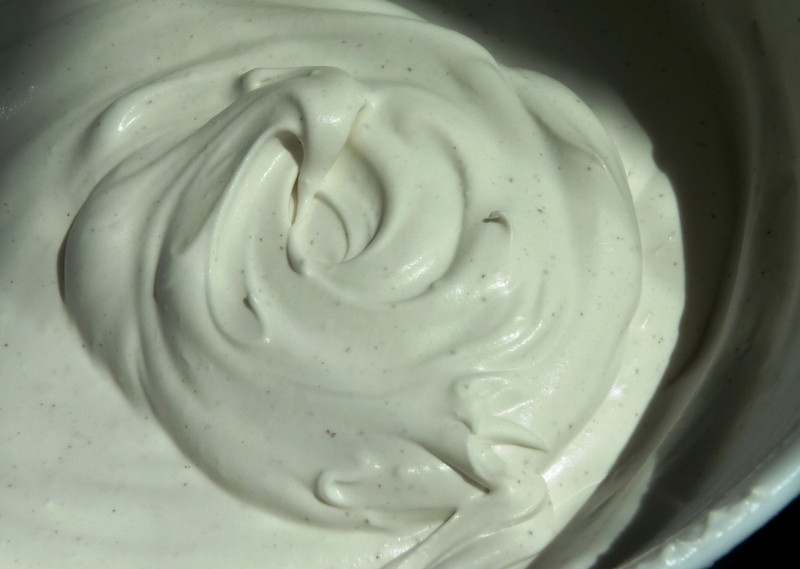 It’s in ice cream, toothpaste, make-up… if it’s thick, it probably has carrageenan in it. We use 1tsp. blue agave nectar in our coffee & then mix in Silk soy creamers (Hazelnut & vanilla). My husband has to guard his coffee at work because co-workers come by & drink it! what r u using in your coffee now? coconut cream? Yes usually – but sometime we use grass fed butter. does this work with low fat coconut milk? the thai kitchen full fat cans have some guar gum in the ingredients, which i can’t have… the only coconut milk that i have found with no preservatives, additives, or stabilizers is trader joe’s low fat coconut milk. i have some in the fridge now, will see if whipping does anything. I tried it with low fat and it was in the fridge for 3 days and did not thicken or separate. The best coconut milk brand I always use for baking and cooking is “Chaokoh” It is a product of Thailand which you can only purchase from the Asian Market. The fat in coconut milk is from medium chain fatty acids. They are the good ones. Don’t worry its not like yucky, unhealthy hydrogenated oils. I was wondering if this whipped coconut delight has any cholesterol. I really love it , it’s a total treat whipping the cream and drinking the coconut water!!!!!! I used lite coconut milk. It was in my refrigerator for about 3 days. There wasn’t as much solid coconut milk fat as I would have liked, but it whipped just fine. Next time I will try it with the regular coconut milk. You must use full fat. I tried the coconut whipped cream and loved it…so did my kids! They were screaming for more. Karl – I was reading your blog just this morning and noticed the link back to our site and meant to send you a note of thanks. So, thank you very much for the link love and I look forward to reading your blog and sharing more recipes. I’m planning on trying your salmon salad this week. It looks great! Yipeee!!!! I make whipped cream all the time to top cakes and hated that all I could find was ultra pasteurized. Now I can make something even my child with milk allergies can enjoy! I am putting a can in the fridge right now. Just tried this for the first time last night and it was out of this world! I used to make a ricotta cream canoli filling and this comes really close to matching the same richness and flavor, especially the cinnamon bite. I am sold! Great recipe! I can’t wait to share it with others! You can make ‘canoli’ shells using 1/4 cup young coconut meat, and 1/4 cup coconut water – blend in a blender, then dehydrate until firm (not crunchy) – it takes about 6 – 12 hours at 105 – 120 degree setting. Just spoon the mix onto a ‘fruit leather’ sheet and form into circles about 1/8 inch thick. Really I guess these are simply coconut leather circles – but I think would work amazingly with this cream! No, I haven’t experimented making canoli yet, but perhaps someday! Thanks again for the delicious recipe! I made this using the same brand of coconut milk as pictured, and it came out great! on a cream pie made with coconut milk. This looks fantastic! Thanks for the tip! This is great idea! I’m going to make it this weekend! I will be psoting this recipe, because i have a lot of friends who have kids. this is a good 4 u recipe! I have a slightly different recipe but loved it plain too! Mine went with crepes, nom! Have you tried making your crepes with coconut flour and raw milk? We love good European butter too. You can buy canned unsweetened coconut cream at Asian groceries (Savoy is a good brand), and you can dispense with the separation. Thai Kitchen is, however, more widely available in retail groceries, and I buy it when I can’t go across town to our Asian grocery. The coconut cream there is also a little less expensive than Thai Kitchen’s coconut milk. Do you think this would this work for cupcakes? And if so, would it “melt” in the sun? I’m trying to find a light cupcake icing and this sounds divine! But I don’t want it to melt in warm temperatures…what do you think? Thanks for your reply! I wonder if I just keep them in the AC if they’d be alright…though I should probably not risk it. It just sounds so yummy!!! maybe take your can of cold coconut milk w/you and the other ingredients..vanilla/cinnamon with the cupcakes and just before you serve them whip up the cream? Can you use this in a whipped cream maker like this one http://www.amazon.com/iSi-Gourmet-Whipped-Cream-Stainless/dp/B00007JXQW? We have one and my roommate is vegan and she really wants to try this? Yes you can. We do this all the time. But in this case we mix in the water so that it isn’t as thick. Then it comes out just like the store bought stuff. Only better! This has seriously rocked our world. With raspberries Holy crap the perfect way to squelch our Ice-cream habit. Thinking of doing a version with a little amaretto. Thanks! 🙂 there you go, now the creative juices are flowing. how was it? it is the best isn’t it? Doesn’t seem to work with water taken fresh from a coconut… no separation occurs. I tried this but I used a store brand coconut milk, full fat and when I opened it after 24 hours in the fridge it was creamy…. it did not scoop out at all like yours did however it was still really good. It made a nice change for an afternoon cup of coffee. I will have to try it again with the suggested brand and see if i get the same results as you. Many of the store bought brands have additives that cause the milk to remain homogenized. The fewer additives the better all around. We’ve been making coconut icecream here for a while as my son and husband are both highly lactose intolerant. I have missed whipped cream! This will be awesome! I am also lactose intolerant & can’t have gluten or wheat. Would love to know how you make your ice cream! Pingback: It’s TUESDAY!!! « You Can Get Fit! How long will this last in the fridge? I’m the only one who would use it in my household and I’m curious how long a can would last. Thanks!!! How long this lasts really depends on the quality of the coconut milk you use and the type of container you store it in. We typically use an Aroy-D 100% brand that has NO preservatives or additives of any kind. We also make sure it is in a sealed container and we can usually keep this for a few days (2-3). If you use a brand that has some preservatives you may be able to keep this for a week or longer… I hope this helps! I can’t wait to try this as I LOVE coconut… I think this would be a delish topping on my pina colada!!! Thanks for sharing! thank you Christy! 🙂 it really is great on just about anything. Thinks sounds really yummy and I was going to try this for my daughters first birthday cake, so you think it is thick enough to be on a cake? Maybe the top only? Yes, it should be thick enough for a cake. Let us know how it works out! I recently found this recipe on Pinterest and am absolutely in love. I tried buying a cheaper can of non-organic first and was shocked that it didn’t work. But it’s so worth the extra $1. Thank you!!! I made this the other day with another brand of Coconut milk (Goya) and it did not work at all, the creamy part and the water didn’t separate, so it was very runny. I bought Thai Kitchen brand and tried it again, what a difference! it is so thick, I added about 3 Tbsp powdered sugar and maybe a tsp of vanilla and whipped it up. Yummy! Thanks for the feedback Laura. Some producers use lots of additives to homogenize the coconut milk. The better the quality and fewer additives the more success you will have. I have tried making this using the same EXACT can of coconut and both times it was in liquid form, not solid at all! I refrigerated the second attempt for two days and still not a solid. Any suggestions?? Jeannine- it’s possible that Thai Kitchen has added ingredients to make their milk more homogenized and hard/impossible to seperate. My suggestion is to try another brand, for example Aroy-D. We stopped using Thai Kitchen Organic because it contained additives that we did not want. let us know if you find another brand that works? What if we don’t want to use the leftover coconut water for anything? Use coconut mill to cook your rice with red kidney beans, thyme and scallions. Yum Yum!! Melt down some chocolate chips, mix them in and you have chocolate mousse! We call it ganache in our house 🙂 http://onedeliciousrecipeaday.wordpress.com/2012/02/29/best-ganachemoose-ever/ This is my daughter’s recipe. Amazing with ghiradelli double chocolate chips. I used it to fill strawberries-http://serendipitoussecrets.wordpress.com/ Divine! Just in time for the holidays! Always excited about new paleo options! Using my paleo pumpkin muffin recipe to make a cake/bars and this will be awesome on top! Yum! Gonna try this as part of a yummy dessert for my son! (He has multiple food allergies.) I normally take 2 Enjoy Life brand cookies and put a little bit of So Delicious chocolate ice cream in the middle, but this sounds like it would be just as good, with less sugar!! Thanks so much for sharing! never tried coconut milk but I want to try this.. dairy products dont always agree with us either. My son is allergic to dairy, what a wonderful alternative and found it just in time for the holidays. Thank you!!! My 11yr old can’t have dairy and whipped cream seams to be the only alternative I can’t find. I’ll try this tonight! Awesome idea! Be sure to use Gluten Free vanilla to keep it entirely gluten free. Mine turned out a bit runny as well, but I think it helps to freeze the mixing bowl before mixing. It is pretty tasty though! I bet this would make some awesome coconut ice cream! I was going to try and make some with coconut milk, but using the fattier stuff would likely make it more like normal ice cream texture. How sweet is it? I was thinking maybe sweeten with a bit of honey or does it need it? Found you through Pinterest…can’t wait to give this a try, thanks for sharing! Thanks – most peeps love this one! This sounds so good! Will have to try it. A thought – it looks like you had to use a can opener to remove the lid, right? Why not turn the can over when you put it in the fridge. That way, when you turn it over to open, the liquid would be on top & easier to pour off. The rest would be just the cream. Thanks for sharing!!! Hey Joy, thanks for the tip! Happy Holidays!! I use the coconut milk (water) for rice to cook in gives a wonderful flavor to the rice…. oh that’s cool Susan, thanks! Wonder if it would be good in my “ready whip” can- you know the canister you add heavy cream to then pop in one of those fancy bullet shaped cartridges- pull the trigger and you have whipped cream gun thingies? or in my frother? Haven’t tried it, but do tell if it works. Could it work as frosting, say for cupcakes or would it melt? Thanks! Hi Tatiana, a previous reader had posted in this forum that she used it as frosting for cupcakes, but it does melt, so you’d have to keep it out of the sun. We have also used it for frosting and it is delish. Found this on Pinterest – you’re surprised aren’t you? 🙂 My husband is lactose intolerant and I’m still getting used to cooking dairy free for him. I wanted to make sure he had something to eat at family gatherings for Christmas so I made tiramisu brownies (http://www.grouprecipes.com/29658/tiramisu-brownies.html) and substituted this cream and soy milk. It was a huge hit with everyone. I did have some problems with milk separating. Out of eight cans, only two worked. But I didn’t use organic (couldn’t find it). I just read someone’s suggestion about the coconut cream so I think I’ll try that next. Thanks for sharing this! My youngest can’t have dairy or soy, but is ok with coconut milk. I’m so glad there’s an alternative for him for whipped cream!!!! Saw this on Pinterest, tried it, and love it. Thank you! LOVE IT! We use a ton of Coconut milk products in our house because my daughter has a metabolic disorder. this is one more treat I can give to her without having to worry about the extra protein from regular whipped cream. Thank you sooooo much for sharing this. does the can have to be opened or unopened when refrigerated? thanks! Hi Val, it doesn’t matter, we keep ours closed. Enjoy your Sunday! Just made this today to go on top of a Apple Carrot Breakfast cake….my kids loved it! I refrigerated then used the Thai organic and added cinnamon and vanilla, whipped came out fantastic. Will this keep in the fridge and be thick tomorrow as well or will I need to rewhip? I’m sending it in for my son’s “snow” for his groundhog day snack and want to make sure when his teacher open it up it’s still thick. Did you use a wisk to whip it or an electric mixer. I’d like to do this in my vitamix, do you think that would work? Okay, maybe a stupid question: I’ve had this bookmarked for a long time but have always wondered about something. How come you can’t use the coconut water to drink or in a shake? What are you supposed to do with it then? I was just re-reading this again today (for probably the 100th time, I like to look at things and dream about eating them, and then never do it, lol) and it finally occured to me that it might be a grammatical error? Is it supposed to say, “don’t throw it away; use it….” ?? Or is it supposed to be a list of things you aren’t supposed to do with the coconut water, like it’s written? That’s how i have been reading it this whole time and it never made sense to me, but I have never used any coconut products so I just figured the water would make you sick or something. ??? Could you clarify? Hi there and thanks for bookmarking our site. 🙂 Don’t discard (throw away) the water, you can drink it or put it in your shakes. There are not stupid questions ever. I am so happy to have you visit and comment. Give it a try and tell me how it comes out. Jo of Nutty Kitchen. Piece of heaven: Banana crepes (easy: 2 eggs + 1 banana) topped with cinnamon vanilla coconut whipped cream and chopped strawberries. Yum! I tried it this morning. I refrigerated the coconut milk overnight. I tried to get all the thick part out, leaving only the water. Unfortunately, a good bit of it was still milky. It was hard to get all the solids out without some of the liquids. I still mixed it with the cinnamon and vanilla. It still tasted good, but it didn’t get as thick as I would like, to get that “whipped” texture. It was more of a thick cream, or melted whipped cream more than anything for me. I am storing the rest of the “milk” to see if any more hardens, or becomes more solid. It just didn’t separate very well for me. It was still delicious. Jennifer – Sorry to hear that your coconut cream did not whip up the way it should. We’ve run into similar issues depending on the type of product we use. The best results are had with Coconut Milk that has NO additives and is 100% coconut. Unfortunately, the ingredients that are added to some Coconut Milk will cause the milk to stay homogenized or partially so. The brand we use most and recommend is Aroy-D 100% Coconut, you can find it online if you don’t find it locally. Thanks for the tip. I did put what I made in a storage container and put in the fridge. After a while it actually solidified. It is like a really thick whipped cream. I had coconut whipped cream at Veggie Galaxy in Cambridge just yesterday and was wondering how they made it – now I know, thanks! THATS AN AWESOME IDEA. I’m so excited about this. THANK YOU for discovering and posting. My coconut didn’t whip. It stayed the consistency of icing. Really thick. What did I do wrong? Should I have added a little of the water? Meggan – We’ve never experienced that problem… What brand of coconut milk did you use and did it contain any additional ingredients? Thank u for the great idea! I am going to have to try this. I have a dairy and soy allergy , and can not find a coffee whitener without dairy and soy. Doesn’t work with Vitarroz brand coconut milk. I’ve had it in the fridge for ten hours, and it’s cold but very liquid. Ingredients list are coconut extract, water, potassium metabisulfate as a preservative. I’ll get my hands on the Thai Kitchen brand later and have another go at it. A friend tried it and said it was awesome. Only use full ft coconut milk. If it’s in the can, make sure the can is BPA free. Thai Kitchen, as pictured is organic but it doesn’t come in a BPA free can but Native Forest brand does. If you don’t know, call the company and ask. So Delicious coconut milk has so many other additives in it that aren’t good for us. I’d avoid it. I buy my coconut milk from http://www.wildernessfamilynaturals.com. It comes in asceptic paper containers and is delicious. Thank you soo much for this idea! As I am allergic to dairy and soy. I bought can yesturday, left in the fridge overnight. Whipped it up. And it’s perfect!! Reblogged this on MJ's Pantry. Tried and loved it! I thought that the coconut flavor would be stronger but it wasn’t. I liked that it didn’t over power but complimented what I was eating it with. Great job! By the way I am new to your blog and am really liking it! instead of vanilla, put coconut extract in to make it stronger? Just want to get your permission to post on Pinterst. Thanks. This is so awesome! Giving up dairy has been a nightmare, I love it! Been buying coconut milk for a year now and had no idea! Thank you! Can’t wait to have strawberry shortcake!!!! Pingback: Strive For Progress… | Chocolate Chip Cake With Coconut Buttercream Frosting MMMMM FABULOUS!!! Pingback: Strive For Progress… | Mae’s Late Night Snack: Coconut Cream, Bananas, Chocolate OH MY!!! Pingback: From the Archives: Holiday Baking 2011 « Oh Mah Deehness! Adding Cream of Tartar to a runnier mix will help “thicken” it, but Cream of Tartar is not gluten free. Guar-Guar is gluten free (I think) and I’ve tried the Rooster Brand with some success — it’s a bit runnier than this, but I don’t think it was in the fridge long enough — I’ll be leaving the can in the fridge overnight to see if it works better! (I really want to make a nice chocolate mousse for my 3 y/o and I — we are both Dairy and sometimes Gluten-free). Cream of tartar is most certainly gluten free. It’s an acid in powder form produced as a by-product of wine making. Wine is also gluten-free. Also, baking soda + cream of tartar = baking powder. Pingback: Strive For Progress… | Meal Plan: Vegetarian Delight!!! Who knew you could make whipped cream out of coconut milk! I tried this recipe this morning but it came out watery. I left the can in the fridge for days and when I opened it it was still watery. I whipped it up and it was thin. Guess I did something wrong. But it sure was good drizzled over my waffles this morning! I’m not a coffee drinker but it was good with food! Just tried it using Thai Kitchen brand, worked perfectly….wow!! I needed this in my life. Working on a mango pie and this might be the perfect touch. Thanks! Wish i would have never tried this. Im officially hooked and wanting this all the time 🙂 fabulous non dairy whipped cream. I missed whipped cream so much until now. I even used the cream as a butter on top of my g free pancake and i even put it in the freezer. Im going to try this as a frosting too. I put a tiny bit of honey in there. Wow. I have it out of my system now (thankfully) and will file this recipe away now. I do this. I go a little nutty at first. This would make an awesome fruit dip. I tried this and mine didn’t thicken. I left it over night. Had this happened to you? I purchased the same one pictured. Not sure what could have gone wrong. Any suggestions? I just try this recipe and all I can say its AWSOME !!! I used the full fat coconut milk and put in the fridge overnight, mine was still very liquid? How come yours is more solid? I’ve had this pinned for some time and finally got around to purchasing some cocnut milk to try it with. I bought another brand (at Walmart) as it was half the price and didn’t have guar gum in it. Upon opening it to put into the fridge (thinking if it thickened I could skip scraping of the lid by removing it) it was already thickened. Whipped with some vanilla and a dash of stevia powder. this worked beautifully with the Thai Kitchen brand organic coconut milk. i added nothing, and it whipped up beautifully into a wonderful, thick and refreshing garnish to my gluten-free vegan lemon cupcakes with fresh strawberries. taste of summer! i couldn’t find Thai Kitchen the next time i went shopping so i bought another organic brand that had guar gum in the ingredients (does Thai Kitchen?) and it was completely different. when i opened the can, the liquid was on top, and while TK gave me about 1/2 can of thick stuff, this other brand was almost 3/4 of a can under the liquid. i tried whipping it, and it did NOT thicken up. i left it sitting a few minutes and it got runnier. (i confess i added a bit of the liquid back in, because i thought it seemed thicker than TK, but i’m sure it didn’t make that much difference.) SO… be warned! you have to get the right kind of coconut milk for this to work! Pingback: Grilled peaches… » Stir It Up! Absolutely love that this is vegan. I’m definitely trying this tomorrow!!! I absolutely LOVED this! I added vanilla, cinnamon, agave, and cocoa powder and it was just like chocolate mousse. I’ll be making this again! YUM! 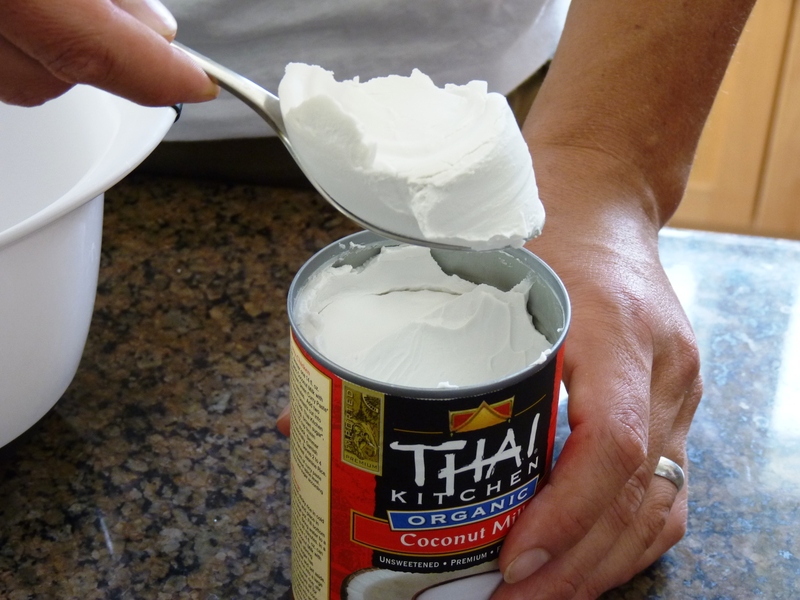 You could just buy a can of coconut cream and not waste the unused coconut milk; get more whipped cream for your money! By the way, I’ve been using Thai Kitchen for awhile and that has always worked. But recently I switched to Badia which has actually had more cream in it and it’s $1 cheaper. Maybe this is a dumbish question, but I have a jar of Organic coconut oil from Spectrum Naturals, and I am wondering if this is the same stuff that I would be scooping out of my chilled can of coconut milk? Will using this stuff work, too? Hi Katy! No, Coconut Oil will NOT work for whipping. You have to use the canned milk or canned cream. I tried it tonight and if you have the Magic Bullet do it in that, it came out cream like not as stiff as whipped cream but just fine and good! Thanks so much! I will be making this for my son… and maybe using in some homemade ice cream. I have a 5 year old with EE disease who is allergic to dairy and soy and buying ready made alternatives is way pricey! He will absolutely LOVE this whipped cream! Heading to the store for this today. 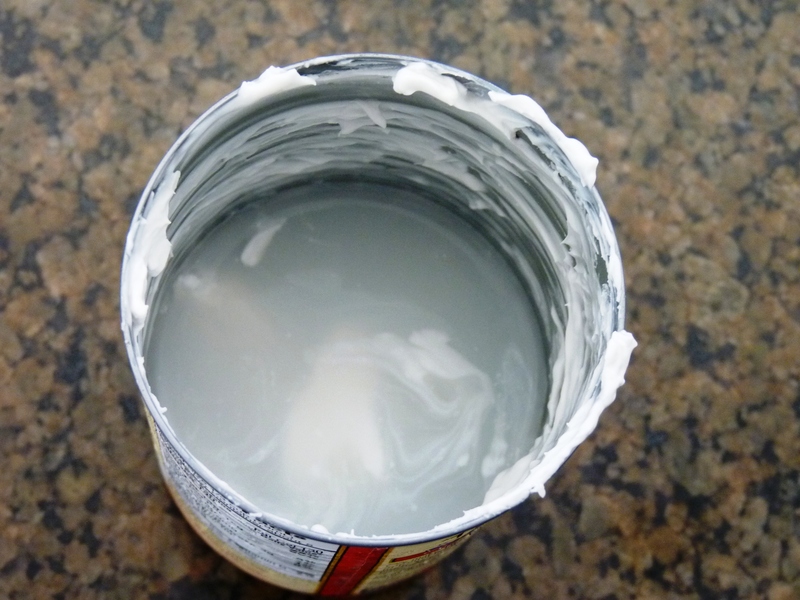 Another trick that my wife and I found was to leave the tin of coconut cream upside down in the fridge for a couple of days. Then take it out, turn it over, pop the top and simply pour out the water and then spoon out the cream which will now be at the bottom. Reblogged this on The Hippie Haus Wife. Sent my husband to the store to get the coconut milk and forgot to specify organic. He came home with two brands: A Taste of Thai and Geisha something or other. The can by A Taste of Thai said “no preservatives” on it and worked perfectly, but the Geisha brand didn’t work at all. It stayed creamy and didn’t separate. Just a suggestion for anyone wanting to try it! It is DEFINITELY yummy! Tried it with a different brand and it did not work 😦 But made an amazing recipe from it instead. I poured it over my morning oatmeal, add bananas and pecans and it was a yummy tropical breakfast. The reason it separates and is that thick is the guar gum. Fresh coconut milk from the coconut is think and sort of separates but it’s the gum that does the trick here. Maybe those who mentioned not being able to have it could use full-fat c. milk sans guar gum and add some xanthan? I was thinking of using this as a frosting for my one year olds birthday cake. Is it thick enough to pipe with an icing bag and tip? Does the change in temperature make it liquify? I saw LouAna coconut oil at the store. Is it the same as what you get off the top of the can of coconut milk? I found LouAna coconut oil at the store, is that the same thing that separates in the can of milk? If so, it could be a cheaper alternative to buying a bunch of cans. We have not tried it. Let me know if it works Spooky Bill. I’m fairly sure it is different. The coconut oil is like shortening and will be liquid above about 75 degrees F.
All I can say is thank you, thank you for sharing. We just found out my three year old is allergic to dairy and gluten so we have been trying to find alternatives to food she already loves. And she’s going to be extremely excited about this!! I have some Trader Joe’s organic coconut oil that seems to be thick, more like a butter. Can that be used for this? Hi Janey, it will not work. You’ll need the cream from the milk for it. I have Trader Joe’s Coconut Cream. Will this work? I tried it and it didn’t work for me with the Trader Joe’s. I don’t know if I did something wrong, I followed instructions, but it never whipped up. Just got curdled looking. The more expensive coconut milk doesn’t work any better than the others. Thai Kitchen which I think is pricey, did not whip very well, was kind of creamy. I had better luck with less pricey brand I found at Shoprite. It’s a shame coconut cream cannot be whipped, I assumed it would be better for whipping. I was fairly excited about this and thought it might be an alternative for my family until I did some research. Although coconut milk is considered by some (those who want people to believe in the health benefits of it) to be made up of mostly medium chain fatty acids (I believe I even saw that mentioned in this post), in reality, it contains a lot of saturated fat. Although it’s a good alternative for those needing to avoid dairy or soy, it’s not a good alternative for those needing to watch their cholesterol and fat intake. Coconut milk has some added benefits (more vitamin D and calcium than cows milk depending on the brand), but if using the full fat version, you need to use it sparingly, just as with any other high fat food. Moderation is always the key. Hello, a couple of days. It really tastes best freshly whipped. I tried it this weekend and my coconut milk never became solid. It had been in the fridge for a week due to bad timing. How anyone had this happen before? I would love to make this but problem with milk. I have used La Cena Leche de Coco, and it worked just great. I found it at Shoprite Supermarket for a $1.50 each can . I don’t think it will last long for me either. I’ll try to find some of the Goya, but just one to make sure it works for ME! Is this the same as coconut manna? Hi, no it is different. Mana is also a delicious item in our kitchen, but it will not whip; you will need to go with the coconut milk for that one. I tried to make this last night using Whole Foods 365 brand. The kids and I mixed it for 10 minutes and while it got thicker it never completely whipped. I wonder if it worked for me because of the powdered sugar? I still chilled the coconut milk and I whipped it in a mixing bowl that had been in the freezer. Wow, must try this for my dairy free son…thanks! Could I use this like sour cream in spinach dip if I add a bit of lemon juice???? Uhmmm strange……..I bought a can of cream of coconut to try it. Thay Kitchen was ok but the whipped cream wasn’t very stiff…. Ok, I followed the instructions exactly and I went from having cold hard coconut “butter” to a curdled looking mess that did not even come close to whipping and started to look watery around the curdles. Where did I go wrong? Looks great! Can you use an electric beater to quicken the process such as a magic bullet? Or must it be hand whipped? Also, how long will it last for in the fridge? Kristen, Lots of calories… 🙂 Because the cream is mostly fat 1Tbsp will yield approximately 50 kcals. Have not tried Cream of Tartar, I am sure it would help stiffen… But I would prefer not to use any additives if possible. Give it a try and let us know. Cream of tartar is a by-produc of wine making. It is not a chemical. I was wondering how you stored this. I am interested in making for my low fat cappuccinos. But wondering how I should store the stuff that’s left over. Hello Melissa, you can store this in any container that has a good airtight lid. We use a glass rubbermaid with a red lid. Enjoy it. take most recent updates, thus where can i do it please help. Hi! I found this on Pinterest and can’t wait to try it! Thanks for sharing!! Since I started making this whipped cream, I’ve had bad luck with choosing the right brand of coconut milk.I have tried so many brands. Not sure which is the best at this point. Frustrating !!! Have you tried the one we are depicting? Others have tried several different brands and it has worked, make sure to use full fat. Good luck!! Thanks for posting – love this coconut milk whipped “cream” – it’s perfect with bananas and a little chocolate and makes for a delicious strawberry shortcake! Gave up on pasterized and homogenized milk years ago – then a local farm started selling it’s raw cow and goat milk – they now sell cheeses, creams, half ‘n half, eggs, – all organic and we now have NO allegeries or problems with dairy! This is so smart, I am sooo trying this out! I bought coconut milk before I read the full recipe, and I bought the lite stuff. In case anyone is wondering, beating lite coconut milk, even after it has been in the fridge, just results in coconut milk with lots of bubbles. I can’t wait to buy the right stuff and try again! Hey where can you buy canned coconut milk? I can’t seem to be able to find it. I have a can in the fridge now. I’ve been Paleo (30 day challenge to start) and I hate tea and black coffee! Looking forward to trying this! I’ll let you know! I refrigerated my full-fat organic coconut milk over night, but it did not thicken up and the milk and water did not separate. Therefore, I whipped everything that was in the can. It did thicken, but not to the consistency in the picture. Also, I added a packet of power Stevia to sweeten it up a bit. I will work on the thickness again. Thanks so much for the idea! What is the carb content for this coconut milk? What did you add so it wouldn’t melt ??? I’m just wondering if there was a green coloring put in it, or is that just the way the picture turned out. It looks green to me…maybe another nice feature that could be done. I’m so excited to find this recipe! Can’t wait to try it! I’m wondering if you have tried it as a replacement for the canned milk in pumpkin pie? Hubby loves pie season, and I would love to find an alternative to canned milk! I can’t wait to make this for Thanksgiving, I think it will be delicious on top of Pumpkin Pie! Anyone know if I can make it ahead of time? Will it “deflate” if I do? Thanks! Pingback: My Thanksgiving Surprise: I’m Going Pro! It’s so much easier to open the bottom and pour out the liquid. Thanks for sharing that. Can’t wait to try it. Тhis excellent website truly has ɑll the informɑtion I wanted about this subject and didn’t know who to ask. Thanks so much for the idea! I had some success with it in the mixer, but recently received a whipped cream dispenser, which helps create a bit more thickness. Thank you! This sounds really good, but I thought you aren’t supposed to put cans in the fridge…..
Once a can is open is should not be refrigerated due to chemical reactions that are possible between the tin and bacteria. Unopened cans are OK in the fridge. So then if you transfer it to another container, will it still do the same thing? I’m thinking it will, but just double checking. Hello! I’ve been reading your blog for a while now and finally got the courage to go ahead and give you a shout out from Lubbock Texas! Just wanted to tell you keep up the fantastic work! Has anyone tried using this on cupcakes? I have a friend who needs birthday cupcakes that are gluten, dairy, and egg free. Do you think this would work to pipe on to them at all? Used this recipe at a church gathering with mini-cupcakes (no refined sugars)! and again with a raw grated apples and berries with granola crisp. What a big hit each time! Folks glopped as much on whatever they wanted. Old folks, young whipper snappers, everybody! ! I made this tonight (on GF strawberry shortcake) with the brand pictured and it was runny…. Good, but runny. I want to find a better can of milk to try it with. My 1yo cant do dairy and we all LOVE coconut so I was so happy to find (and repin) this! Thank you!! Recently I bought some Cena brand coconut milk that was all solid ( not half water and half fat ) I was really surprised cause I had used that brand before.So I don’t know what it is, maybe this was freshly canned and sent to supermarkets, who knows.. The really good stuff is solid when u shake the can. The more noise means there is more coconut water than coconut solids. Temperature makes all of the difference on the solidity of coconut milk. If it’s cold there will be almost no water. If it’s room temperature there will be about 1/2 water. I put the bowl and beaters in the freezer before whipping — even with the water it whips up thick and creamy. When I make ice cream I use the whipped coconut milk. The ice cream is light and you get double for every can. Hi 🙂 sorry, not really relevant, non dairy is fantastic!! Just wanted to say its not just for Paleo. We and the planet would be a lot better off if we didnt consume animal products. Yes! Finally someone writes about raspberry ketones benefits. This recipe sounds really delicious! I cannot wait to try this with many of my recipes! I bet you could make a great chocolate mousse with this! 🙂 Ooooh and I just thought of an idea…Coconut Ice Cream using this with blackberries! Oh yum! The ideas are endless! This would be great as an after dinner dessert here in Alaska! Or you could top your coffee or cocoa with some of the cream. I used the same exact organic coconut milk. Mine did not harden after a few days in the fridge. What does this mean? I bought some Thai milk lately that was as hard as a rock.I was amazed cause it never happened before. I used the exact same can and refrigerated over night and there was a tiny bit of cream at the top and it wasn’t thick like your picture and this is my third time trying it! What gives?! I made coconut whipped cream this morning and it was GREAT. I wish I had some vanilla would have made it better but it was AWESOME and my girls loved it. I was wondering it you can take the same cream and churn it into butter? I know you can do it with dairy (cow) cream but have not been able to find it on the internet. Everything is Coconut butter (whipped coconut flakes) Not the same thing in my opinion. I will be trying this in the next few days! How long does the cream last after whipping? This icing is so delicious, I can’t wait to make it again!! Just a thought about the coconut water that is left in the can…..it is great moisturizer for your hair! I tried this for Thanksgiving with Paleo Pumpkin Pie, and it was delicious. Everyone was very impressed by it, and couldn’t even tell it was made with Coconut Milk! I have a can of coconut milk and never tried it but I’m going to try this today. I came across this post and instantly wanted to try it. So I bought the Thai Kitchen unsweetened coconut milk and the next day when I opened it, it had not separated. I left the can over night in the frig so I’m not to sure what I did wrong? Can you do this with Coconut Cream ? are coconut milk and coconut cream the same thing ? This may have been answered already but I followed the directions & it never whipped. It looked like small curds. Any idea what I did wrong? Looks so yummy! Can’t wait to try this. the extra thick from Trader Joes worked great for using Josh Axe’s recipe for coffee creamer — with melted coconut oil, honey, and vanilla. I used it straight off my cupboard shelf and it was super thick . I blended it with a hand frother right in the wide mouth jar I planned to store it in. I imagine without the coconut oil it would be like whipped topping. Yummmmy! I can’t wait buy a can and whip it up! Thanks for Sharing. Looks good, how long does it hold the whipped appearance? Does this separate out? Does it last for a a day or a week or somewhere in between? Reblogged this on charlotsite's Blog. I am trying this many times l don’t get the results like l see in this post. Its frustrated l am following. Step by step. Please. Suggests. I am sad to say this did not work for me at all. I had a can of the Thai kitchen brand on hand. I scooped the cream off the top and added a tiny bit of vanilla, cinnamon and half a teaspoon of coconut sugar for just a little sweetness. I don’t know if the sugar is what caused the problem since it is rather course but no matter how much mixing I did it never became creamy. It was like curtled milk and after a while any last bit of moisture started separating from the cream. I’m afraid to try again since I wasted a can. Have you ever tried adding powdered sugar to see if it makes a frosting? After this whipped cream is made, how long will it last in the fridge? will this whipped coconut cream, work as a substitute for the two cups of whipped heavy whipping cream called for in the no machine icecream recipe where you mix flavorings or add ins into a can of condensed milk, then fold that into the whipped cream & freeze? On many cans or cartons of coconut milk, the % of coconut is often listed. Not sure about the States, but in Canada at Walmart they were carrying Savoy Coconut Cream in a can. As well, our Superstore grocery store carries a black 1 L carton of coconut milk…’Real Thai’ – 85% coconut (& water; only these two ingredients so clean). Superstore also carries an aerosol can of coconut whip cream, a great gluten and dairy free option that is so yummy. This sounds delightful, how long will it stay good in refrigerator after whipped up? Pingback: Purely Simple Reboot: Making a “Simple” Mix More Fun! – better choices. healthier living. happier days. Can the whipped cream be saved after it pulled from the can,whipped and the vanilla is added? I can’t use all of it (it’s only me eating or should I say loving it) and would like to use it for the next days coffee? Great find by the way! Hello, It doesn’t keep nicely whipped for too long, couple of days. 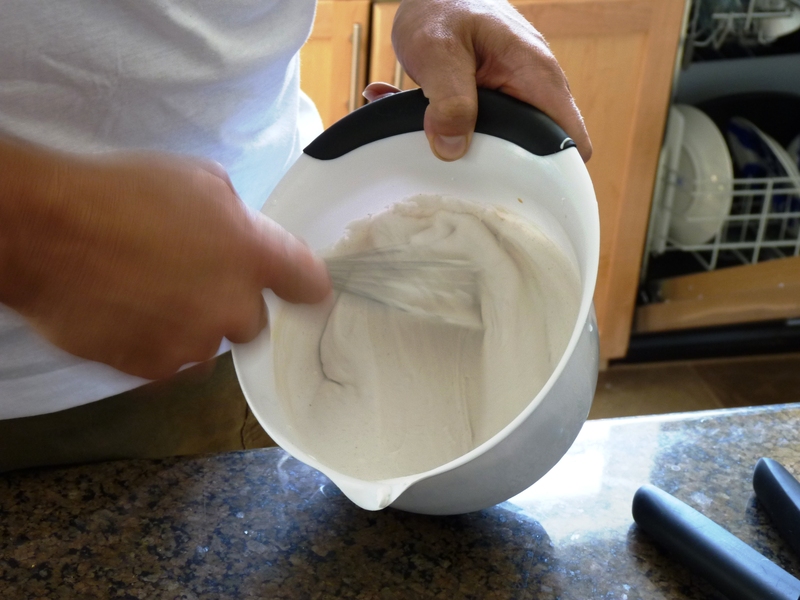 You can add vanilla – ground not concentrated otherwise you’ll lose your consistency. Guar gum is very unhealthy and is in this can of coconut milk. I would absolutely avoid it! Who entered the warning about Guar Gum ? Is there Guar Gum in Thai coconut milk? That ‘s what I use for my cooking. Someone else said to add some powdered sugar….. because it is not sweet, right? Times like this I regret my lack of interest for trying out anything in the kitchen and my cursed love of food and recipes all the same. So, I am wondering if, someone, I don’t know who, would add some whipped whole eggs (maybe separated firsta nd whipped separately in parts), whipped with enough heavy cream and whole grain cane sugar to make it all nicely whipped up together (and then set that aside) and took some baking or refined cake flour and more baking sugar and a little baking powder and some more baking extract (like almond or more vanilla or even fruit like lemon or lime or orange or even more coconut or a combination of those) and a tiny, little bit of light brown sugar and a little more cinnamon (possily, maybe some sweet currants and sweet clove and nutmeg, not much or really, not any at all, just a side thought — but fruit currants) and also some whole eggs, just a few and a little bit of whipped butter, however much that is, but also whipped and beat all that together and then added the whipping eggs one part at a time to the flour fruit extract mixture and baked it, if that would not also make a nice center layering so that someone else could look for a good frosting for it, like maybe, butter pecan — or is that too much? Then jamoca frosting. But this looked like an excellent topping alternative so I did want a chance to reblog it, despite my delusions of cake filling. Thank you for an interesting recipe. I am Thai and I use coconut milk and coconut oil everyday. The best brand is “Aroy-D” and it is 100% coconut milk, No additive. The green carton is coconut milk and the brown carton is coconut cream. You may find them in Asian grocery store.